These posts are bookmarks for me, noting the parts I have to go back to and flesh out … so in that sense this blog is more a piece of writing than a blog in real time. A Midsummer Night’s Dream is my favorite Shakespeare comedy and the spark for my current project, which I have yet to name. Call it Dream. I spent a month writing down ideas based on a simple premise from Act 1, Scene 1: What if Hermia’s father got what he wanted, and she married the boy of his choice? And she was miserable, and considered that her life had been ruined by her father’s patriarchal demands? Beyond that is language, which is where I want to be. For now everyone talks like they’re from Jersey. Sometimes the universe sends me what I need. 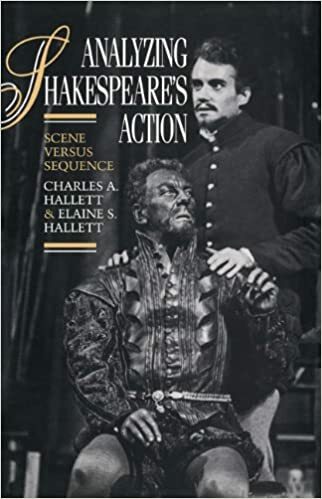 This week it was Analysing Shakespeare’s Action by Charles and Elaine Hallett, which came courtesy of a post on Official Playwrights of Facebook. The Halletts intended this book for directors and actors, but I recommend it for playwrights too. They set aside the act and scene structure favored by publishers in favor of recognizing action beats and sequences. Foreshadowing stands out more clearly, as does Dead Horse Beating. Their analytic method is a most useful dramaturgical tool — for Shakespeare yes, but really for any theatre piece that has significant structure or wants it. I struggle with structure, as some critics say Shakespeare did. This extraordinary insight into how he solved problems with action was worth the price of admission. Yeah, how I feel. Met with Megan McClain at The Lark. She was friendly, clear and helpful, able to point to sequences that need improvement, boring stuff to be cut and plot questions that should be resolved. Now I’m looking forward to rewrites. Maybe. My first two attempts at finding a dramaturg bombed out. What I mean is I didn’t get a response to my solicitous emails for 10 days … an eternity in internet response time. So I decided to stop messing around and went straight to my FB friend Jackie Goldfinger at PlayPenn, who found me a dramaturg in 24 hours. Going to New York to meet with her in a couple days. It’s not a requirement, we could have done a phone call, but I prefer to meet the people I’m dealing with in person and I enjoy going into the city, especially during the holidays. That’s where I am. I’ve written Bohemia, done three complete rewrites and and it should clock in at just under two hours, depending on how the dances are staged. The characters come from The Winter’s Tale, twisted to meet the needs of the action. I like the characters, all twelve of them. That’s just the person I’m hoping will email me back today. Really hoping. It’s been a week of missed connections, wrong email addresses, misdirected Facebook messages, a rollicking comedy of errors. But this is a person I seriously want to connect with. Her research is in Civic Dramaturgy, Performance and the City, Site-Specific Theatre, Contemporary American Theatre, Critical Race and Spatial Theories in Performance, Digital Space and Performance, Dramaturgy and Script Analysis. She teaches Theatre History, Experience of Theatre, Script Analysis and Playwriting and is about to be a PhD. This interest began with the American Shakespeare Center. Since I retired from journalism and then from culinary work, I’ve been writing plays. While I learned the craft I was often stymied by the requirements — especially the limit on characters, or really the number of actors who have to be paid to play characters. Usual limit is 4 to 6. That’s the way the biz works. So the competition and the ASC’s guidelines blew that limit away and opened the door to expressive dialogue … not thees and thous, but words without limit, whereas most modern stage writing is confined to a Seinfeld vocabulary. The obvious question: could I write as well as Shakespeare? Obviously not. Yet somewhere between absolute narcissism and utter despair there is a better question: Could I write as well as someone else trying to write as well as Shakespeare? Probably. Been at it a long time, and getting paid for it. When I started in newspapers, journalism was the best way to draw a regular paycheck for messing about with words. Merry Wives and Henry 4-1 are both stories of Falstaff. I have a Falstaffian friend. Can’t write about him. Except for the insane gloriosity of Midsummer Nights Dream, the comedies don’t fetch me. So I looked at Winter’s Tale. A bad king. An abused queen. A possible hero in the woman who attends the queen, the outspoken Paulina. A blank spot of 16 years between Act 3 and Act 4. I can remedy that, I thought. And so I began. Why this and why that? Because why not. That’s served me well for a long time, because there are so many reasons not to do something and none of them help you to do it. For reasons I’ll get to in a bit, I’m in the throes of a Shakespeare obsession. After a trip to Staunton to the American Shakespeare Center, we talked about renting a teardrop trailer next year and touring regional Shakespeare venues to see what productions we could … courtesy of the member list of the Shakespeare Theatre Association.